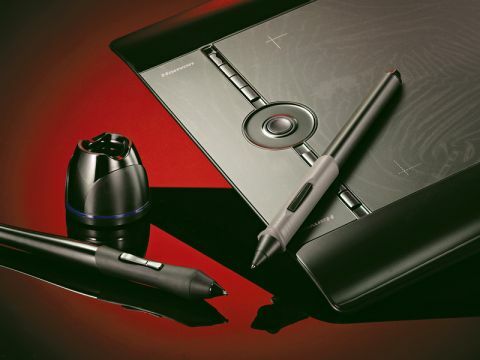 A competitively priced graphics tablet, but is it all style over substance? Calling your graphics tablet the Art Master certainly sets a high benchmark, especially in a market already dominated by a company like Wacom. With the Intuos4, Wacom not only made several technical leaps forward, they also vastly improved the aesthetics and ergonomics of the graphics tablet. Clearly this didn't go unnoticed at the Hanvon workshop. But how does the Art Master 3 perform? You can judge a graphics tablet on one key technical feature: sensitivity. Here Hanvon claim to match the Intuos4 surface sensitivity with 2,048 levels of pressure. This can be a very tricky claim to verify, and difficult to determine as a user. In a direct comparison to the Intuos4, and using Photoshop brushes we're familiar with, the Art Master seemed to falter too often. However, this felt more like an issue with the pen build and it's nib housing than the tablet's surface tolerance. Opening the pen stand (in the same way as the Intuos4's) reveals six identical replacement nibs – which is fine if you like the way the nib feels across the tablet's surface, but we would have liked some alternative nibs. Not only that, there's no nib remover, but worry not: the manual suggests you use tweezers to remove worn-down nibs. Yes, tweezers. These are minor criticisms, and yes, we've been spoilt – the Art Master still has all the functionality of 'that other' graphics tablet. It too has eight programmable express keys, which once set up to suit your requirements, really help speed up your workflow. There's also a jog wheel and pen buttons, but which you can't use if you own a Mac. Actually, that's not entirely true – the jog wheel's been defaulted to moving the canvas up and down, but surely zoom would have been more useful? Hanvon is developing Tablet Setting software for the Mac, but for now it's only PC users who can get full functionality. At this price a graphics tablet should be a long-term investment and everything should work, but it's just not enough to look the part.